Punishment 18 Records | Forged in Blood: a new song in streaming on YouTube! Forged in Blood: a new song in streaming on YouTube! It’s officially out! 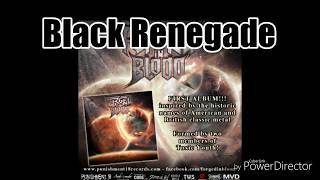 The new audio related to the song ‘Black Renegade’, taken from the brand new album “Forged in Blood”, is available in streming on YouTube. The new release is handled by Punishment 18 Records. “Forged in Blood” was recorded at Elnor Studio by Mat Stancioiu (Drakkar, Longobardeath, Highlord and ex-Labÿrinth, Vision Divine). Ci siamo! Potete ascoltare in streaming via YouTube il nuovo pezzo intitolato ‘Black Renegade’, estratto dal nuovo album “Forged in Blood”. Il full-length è disponibile sul mercato tramite Punishment 18 Records. “Forged in Blood” è stato registrato presso i presitigiosi Elnor Studio da Mat Stancioiu (Drakkar, Longobardeath, Highlord and ex-Labÿrinth, Vision Divine).